Freedom Fone version 2S adds the functionality of multi users with different access levels. The system administrator has unrestricted access to all the system modules. You can have many users with administrative rights, the same applies to the non-admin users. 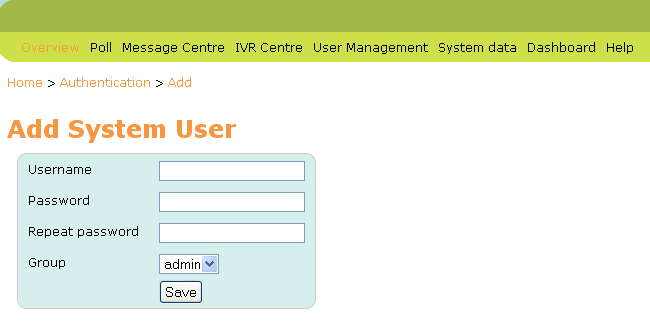 To add a user simply navigate to User management > System Users and click on the Add user button shown in the screen below. When you click the Add user button you are prompted to create a new user: assign a username and password of your choice to the new user and lastly assign the new user with either Admin or non-Admin rights using the group option. The image below shows the interface for adding a new user. Click on the Save button. You can see that the new user had been created.